Zorba was dumfounded. He tried hard to understand; he could not believe in such happiness. All at once he was convinced. He rushed towards me and took me by the shoulders. He was flabbergasted and let his arms dangle by his sides. He made a leap, rushed out of the hut, cast off his shoes, his coat, his vest, rolled his trousers up to his knees and started dancing. His face was still black with coal. The whites of his eyes gleamed. He went back to the hut, sat in front of the brazier and looked at me with a radiant expression. 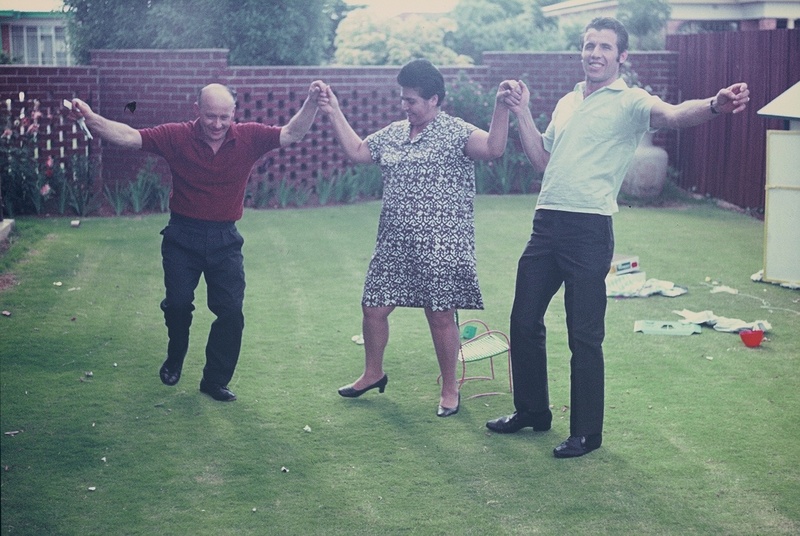 My first memory of Greek dancing was at home in Alberton in the garden after Easter lunch. Someone would put some music to play, a record or 8 track cassette and the people would just start dancing on the lawn in the sunlight. My Uncle Piet would have been a gymnast if he was not forced to leave Greece as an 13 year old and become a second brother to my father. He would dance with energy and happiness, grabbing people to join the line. I was always embarrassed, and as a six year old did not want to dance. I was distinctly antisocial. I remember Uncle Piet bribing me with a one Rand note for each dance. My father was a consummate dancer, with a limited repertoire based on socio-political beliefs. He would dance the Kalamatiano, the Tsammiko and the Tsifteteli. In the village with his best friend he would dance Pos to Triboun to Piperi, How does one Grind Pepper, with his best friend, Gero Vlachos. This last one was more of a tarantella with actions on grinding pepper with various body parts. Trust me; it was really funny to watch. Although he danced in happiness like Zorba, he never did a sirtaki. The composer, after all, was a communist and socialist, although he served as minister under the New Democrats after his return from exile. My father also never danced a Zembetiko. With that, he never broke plates that I can remember. Burn whisky on the floor? No. So who taught him to dance, and who taught him not to dance some of those liberating moves? Remember, he was born in South Africa and first went to Greece when he was 28 years old. He knew how to dance from his parents. I suspect they also taught him what not to dance; what was too modern and what had roots in Asia Minor and the hash dens of Athens. Part of that crisis that unfolded in Greece in the 1920’s must have contributed to them leaving their homeland before the Second World War for South Africa. I have no memory of my grandfather as he died when I was two years old. But I grew up with my grandmother and remember a proud village woman with great principles. She was also very stubborn. I used to love watching my father do the Kalamatiano. He would lead and be held by a handkerchief anchored by his strong brother. My father was an acrobat in the front, a Peloponnesian warrior, dancing from the days of Homer around Achilles spear; he was a Spartan where the woman held the handkerchief for the warrior to spin and jump. When he danced the Tsammiko he was clean and fluid, nothing fancy, but easy to follow. Being tall he stood straight and was lithe and consumed by the music. I remember he would do the Tsifteteli with Aunty Penny and Thea Vasiliki. This is a belly dance and I am not sure if my grandmother approved of this. After all, it is purely Turkish. So why was this dance allowed, but the Zembetiko not? Perhaps it’s because he always did it with an inverted glass of water on his head?